A Gliding Experience consists of a single winch launch leading to a soaring flight of approximately 8 to 10 minutes. Time in the air is very dependent on the time of year and the weather conditions at the time of the flight. Gliding Experience flights must be booked in advance. Upon booking you will be advised of the time you should arrive at the airfield, BUT this will not necessarily be the time you will fly. The club is often busy and Gliding Experiences may be slotted in with other flights; therefore you should be prepared to be at the club for at least an hour or so. Gliding is very much a co-operative sport where everyone helps each other. If you want to participate in these general activities during your Gliding Experience, please speak to your instructor who will brief you. Your flying tuition will be in one of the club’s two-seater gliders with a British Gliding Association qualified instructor, who will give you a full briefing before take off. 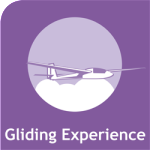 For just £49.00 you can have a Gliding Experience day membership, a winch launch and a flight lasting between 8 and 12 minutes. After completing the purchase you will receive your voucher including information on how to book in the post. I was wondering when you fly for the gliding experience or couples session? Is it just weekends or would a Friday afternoon be possible? Hi, I was thinking of calling to book a glider experience for my Dad’s 70th birthday in January. I wonder do you have age restrictions and how long are waiting lists? There are no specific restrictions apart from normal weight limitations and any severe medical conditions that may endanger the flight. Age is not a problem. The waiting list will depend upon your Dad’s availablity, but we ask you to book the course then speak to Lyn Bone to arrange a suitable day and time. Please call us if you require any further information. Thank you for your reply, i have called the number on your website this morning to enquire further and left an answer phone message. Hope to hear from you soon. Hello, if I purchase a day membership, where do I book a certain day/time?? to fly solo you have to be 14 years of age. You can start flying with an instructor a lot earlier – so you are ready for your 14th birthday to go solo. We do have a cadet scheme at the club to help young persons who want to learn to fly (we had I think 4 or 5 youngsters going solo this year – see our Facebook page). It would be best if you can get in touch with George Green who runs the cadet scheme at the club. His contact details are email: green@virgin.net mobile: 07917414723 . I hope that is of help for you. If you do have further question please get in touch. I was hoping to buy a gliding experience for my husband for Xmas. However he has a heart condition and didn’t know if he would be allowed to but I have read online if he is fit to drive it shouldn’t be a problem. I was just wondering what your policy is? It should not be a problem, depending on the severity of the condition, however if you would prefer to confirm before purchasing the voucher, please call the club and ask to speak with a Committee member or Instructor. Hey, how old do you have to be to do the gliding experience? The limiting factor is more size and weight rather than age. We had some seven and eight years old scouts on flights recently. If you can give us those details we can tell you if it is possible. Can you tell me the weight / height limit for flying please? For a junior gliding day/experience is 150 cm height and 40kg OK? Hi Geoff, yes we will be able to accommodate these measurements. i am looking at getting this as a gift for my husband. How long is the valid for? As i can see from about you do not operate in the winter. the vouchers are valid for one year. We also fly through winter, but don’t do gliding experience, trial lesson or day courses as it would be a great experience through the cold months and the flights would be very short. Hi, I want to book for someone however they have epilepsy, will they be able to do it? I will check if that is okay – hopefully I will have an answer for you by tomorrow evening. yes sure there is. Could you please contact Lyn Bone to arrange for the date and agree the payment terms with her (we generally except cheques and cash). Her telephone number is 0330 123 9277. I hope that helps and you and your boyfriend have a great day flying with us. Also what is the earliest you can do the experience? Hi Ben, you would fly individually with an instructor in a two-seat glider. This page on the website https://esgc.co.uk/gliding-lessons-and-courses/ will give you further details and I suggest you call Lyn Bone on the number displayed to discuss available dates and times. Thanks for the enquiry. hi, i am thinking of booking my husband an gliding experience day for his 50th birthday, is it easier to book through you or through buy a gift? Hi Karen, It will much cheaper and easier to book direct with us. After purchasing the Gliding Experience or Trial Lesson online here https://esgc.co.uk/gliding-lessons-and-courses, you will receive email confirmation then a voucher will be sent to you by post. You can then discuss booking a convenient day and time with Lyn Bone on 0330 123 9277. Please let us know if require any further help. Do you still run your gliding experience sessions during the winter months. I was hoping to book something for Feb/ March? Hi there, we don’t actually book Gliding Experience or Trial Lessons during the winter months, however if you just turn up on a nice flyable day we will try our utmost to accommodate you. I was wondering whether you still offered flights during the winter months? I was looking to organise something for November or possibly December? Hi Alex, unfortunately we do not book trial lessons during the winter months, but if you are local and would like to visit the club on a suitable day we would be happy to try and arrange a flight for you.